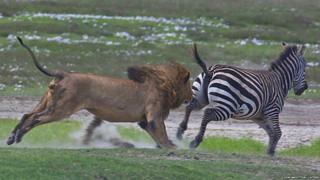 Pit a lion against a zebra in the wild and we know who we'd think would come out the winner! 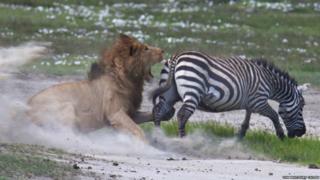 But the lion in this fight found himself a pretty feisty opponent when he picked a battle with this zebra! 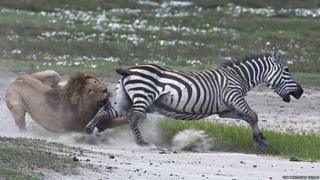 The photographer Thomas Whetten managed to get these incredible photos from the safety of a truck in Ngorongoro Conservation area in Tanzania, Africa. 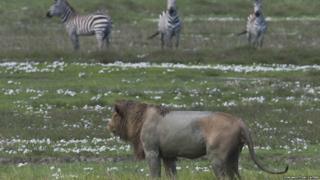 The zebra starts off with no idea that a pack of lions were on the prowl for lunch. 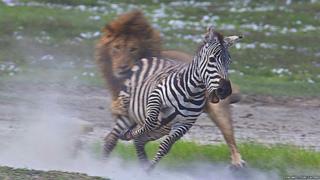 But a lion is hiding in the grass, biding his time, and suddenly creeps up on the zebra who makes a desperate bid to bolt! 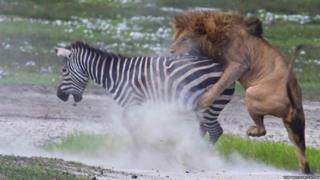 Lions are incredibly fast so he catches up, leaping on the zebra's back. 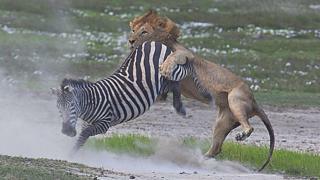 But the brave zebra decided to fight back! 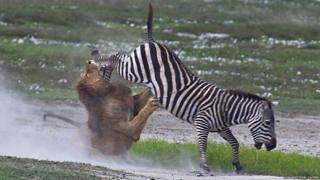 And the lion ended up being rewarded with a massive kick to the face. 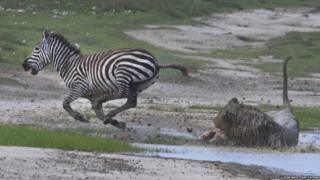 ...but after a high-speed chase, the lion is left in a muddy puddle. 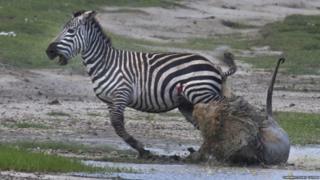 Good on you brave zebra!